An overwhelming 88 percent of Indian parents are willing to send their children overseas for post-graduate studies, according to a recent HSBC report titled ‘The value of education, Learning for life’. This is the highest percentage in the world followed by Turkey (83 percent) and Malaysia and China (82 percent each). Also, about 93 percent of Indian parents surveyed said they are open to paying more for their child’s education in an international university than in India. As part of its study, HSBC interviewed 5,550 parents across 16 countries, with a minimum target of 300 in each country. Most of the interviews were conducted online while some were conducted face-to-face in the UAE between March and April this year. “Many parents recognise that it is more challenging than ever for the younger generation to compete in the job market and, hence, they are willing to help children boost their opportunities for success by funding overseas education,” says S Ramakrishnan, retail banking and wealth management head at HSBC India. In recent years, India and China have sent the most number of students overseas. The Associated Chambers of Commerce and Industry of India (Assocham) estimates that 6.8 lakh Indian students went overseas for higher studies in the last couple of years. The dearth of quality education in India and rising competition for seats in local institutions are pushing Indians to study abroad. 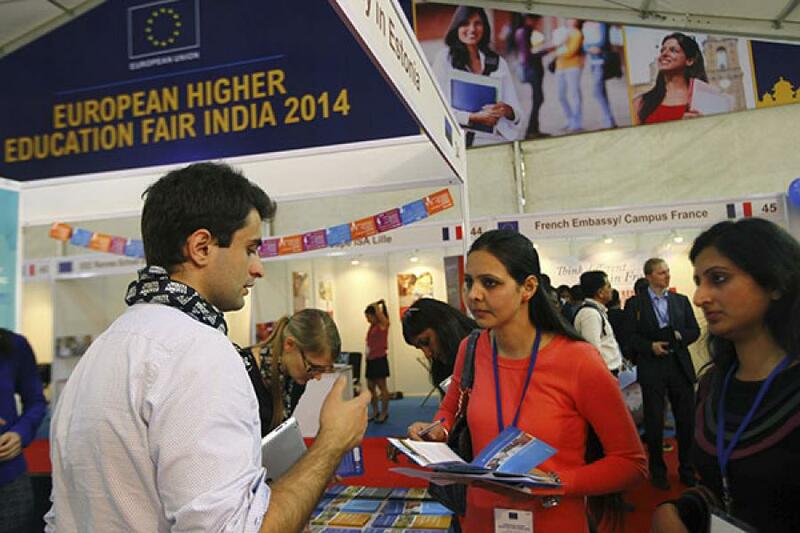 Assocham says, besides the US and UK, Indians are aspiring to go to newer study destinations such as Singapore, Germany, France, Italy, Denmark and Sweden. Globally, medicine, business management and engineering are the most favoured subjects, the study revealed. 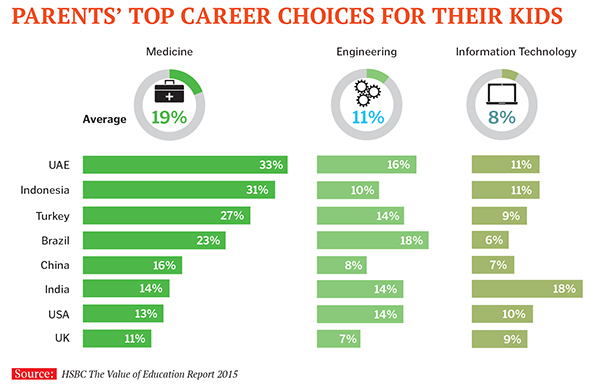 For Indian parents, information technology (18 percent) is the preferred career choice (see chart). They are followed by those from the UAE and Indonesia (11 percent each). Medicine, too, was a popular field among parents from the UAE (33 percent) and Indonesia (31 percent). The study shows that 14 percent of Indian parents want their children to pursue a career in medicine. Australia has the lowest percentage of parents (52 percent) who are willing to send their children overseas for post-graduate studies. It is followed by Canada (53 percent) and the US (59 percent).